During the first few weeks of birth, foals depend on their mother’s milk for sustenance. The mare’s milk contains all the nutrients that a newborn foal requires for rapid growth. That’s why you need to ensure that the mare gets sufficient food and water to sustain both herself and her newborn. It would be wise to keep a close eye on the goal’s nursing habits. When a foal suckles for over 30 minutes at a time, you might want to consider the possibility that it’s not getting enough milk. You could try providing the mare with diet supplements that can increase milk production. Otherwise, you’ll have to consider using milk replacers or supplemental feed. Even when the mare is producing sufficient milk for its foal, you should also consider the nutrient concentration in the milk. It could vary drastically depending on a number of factors – mainly the nutritional status of the mare. You’re probably feeding your mare with high-quality hay, which is fine as the basis of her diet. However, forage alone will be unable to meet the nutritional requirements of a lactating mare. It would be best to use grain that’s been specially formulated to meet the nutritional needs of a pregnant or lactating mare. When a foal is about two to three months old, it reaches its peak lactation period. During this period, the mare requires a lot more food than usual – almost twice the amount she required at the time of her pregnancy. This will help replenish the extra energy that she requires. You should also make sure that the mare gets sufficient amounts of vitamins, minerals, and protein. Foals sometimes start to show interest in feed as early as 10 days of age. They will nibble and sample until they eventually learn to eat solid food. Your foal’s digestive system will quickly adapt to any changes in the diet. By the time a foal becomes eight to 10 weeks old, its nutritional needs cannot be met by the mare’s milk alone. It’s around this time that you should start incorporating high-quality grains and/or forage into the foal’s diet. And make sure you maintain a proper balance of vitamins and minerals in the ration. If the foal suffers from any kind of deficit, imbalance, or excess of calcium, copper, phosphorus, selenium, zinc, and vitamin E it could have a negative impact on its growth. You could start out by offering creep feed to your foal. Creep feeds are milk-based pellets that are fed free-choice and should be kept in a feeder that is only accessible for foals. These pellets are rich in balanced minerals, amino acids, and energy sources that are beneficial to growing foals. By providing a foal with creep feed, you could improve the average daily gain while decreasing weaning stress. Body condition scoring is a system of assessing a horse’s relative body fat. The system uses visual appraisal along with palpitation of six areas in a horse’s body. It’s important to maintain an ideal body condition score for both your mare and her foal. Pregnant and lactating mares should have a body condition score between six and seven. This score should never go below five on the Henneke scale. If it gets any lower, there will be an impact on her reproductive performance. 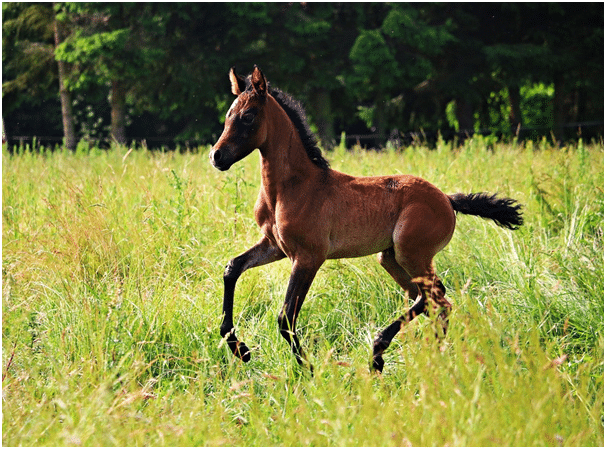 For foals, an ideal body condition score is somewhere between five and seven. If the score goes below or above these ideal numbers, make sure you consult your veterinarian immediately. 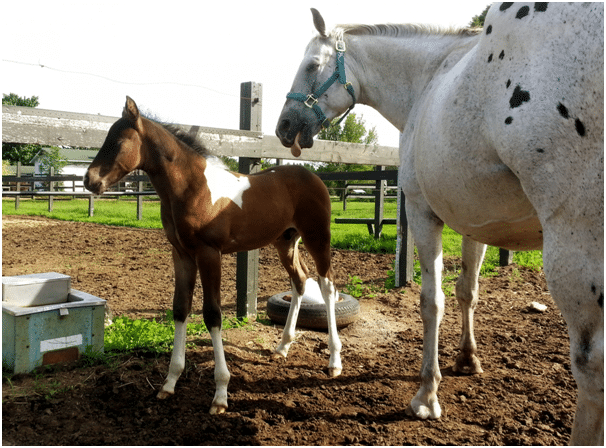 It’s crucial for horse owners to chart the growth of a foal to ensure that it is growing as desired. You can use a scale to weigh the foal and get an accurate reading. If this isn’t possible, you can also get the approximate weight of the foal by using a weight tape properly. You should also use a height stick for measuring wither and hip height. Foals are ideally supposed to gain about half of their mature weight by the time they’re six months old. Similarly, they should reach around 80% of their mature height by this time. If you notice that your foal is lagging behind in terms of growth, it would be wise to consult a vet about the possible reasons. When feeding solid foods to foals, start by feeding just 1% of its body weight in a day. Make adjustments to the feed ration depending on the growth and fitness of the foal. Foals have a small stomach, and cannot consume large amounts of feed at a time. Divide their daily rations so they can have it in two or three feedings. Avoid over-feeding your foals, as they could become overweight. This will put them at a higher risk of developing orthopedic disease. Make sure your foals and mares get access to unlimited amounts of fresh water. These are some essential tips that you can use in order to maintain proper foal nutrition. If you want a foal to get proper nutrition and grow up healthy, it’s equally important to ensure that the mare gets proper nutrition right from the time when it’s pregnant. And you should make appropriate adjustments based on their individual requirements. Got any more questions about foal nutrition? Feel free to get in touch with us.